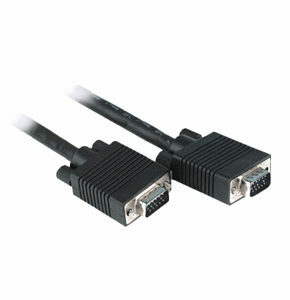 20m VGA Lead, Long VGA Lead / SVGA Cable. 20m VGA lead / SVGA lead. Profigold PROM281 High Performance Mini DisplayPort to High Speed HDMI Adapter 0.2 m. Connect your Mac with Mini DisplayPort to a screen with HDMI input. Transforms a Mini DisplayPort connection into a High Definition HDMI connection Complies with DisplayPort 1.1 and High Speed HDMI standards for unmatched sound* and picture quality Suitable for HD display resolutions up to 1080p White ultra-flexible PVC cable jacket for ease of handling Slim-line plug design for maximum compatibility with portable equipment Superior grade 99.996% oxygen-free copper to guarantee lowest signal loss Double shielded cable and zinc-alloy shielded housing to ensure highest data transfer without any loss Note: *Audio support is only available for Mac Book Pro 13/15/17-in mid-2010 release and iMac 21.5/27-in early-2010 release. Profigold PROM171 High Performance Mini DisplayPort to VGA Adapter 0.2 m. Connect your Mac with Mini Display Port to a screen with VGA input. Transforms a Mini DisplayPort connection into the more commonly used VGA connection Complies with the DisplayPort 1.1 and VGA standards for unmatched picture quality Suitable for High Definition display resolutions up to 1920 x 1200 Integrated 36-bit, 240 MHz video DAC for perfect analogue VGA display performance EDID Pass-through from PC source to display with automatic sink detection White ultra-flexible PVC cable jacket for ease of handling Superior grade 99.996% oxygen-free copper to guarantee lowest signal loss Double shielded cable and zinc-alloy shielded housing to ensure highest data transfer without any loss Powered from Mini DisplayPort source.